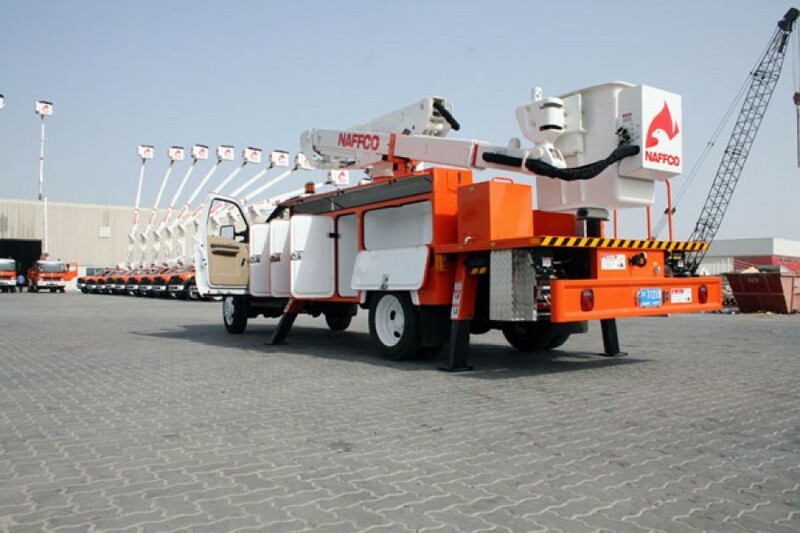 NAFFCO can offer a wide range of platform from 9 to 35 meters working heights (VERSALIFT Line) under different categories like telescopic, Telescopic Articulated, Articulated over center and Articulated Non-over Center Access Platforms. The platforms can be either non-insulated or insulated, chassis mounted or van mounted or even tracked access platforms. Our platforms meet ANSI standards and are CE approved and are known as reliable, high quality products with low maintenance costs. Achieve a redundant measure of security via the Dual Retention system on all cylinders and boom pain. Boom play / maintenance time kept to a minimum with the fiberglass boom’s infinitely adjustable slide pads. Lubrication is simplified by having single grease fitting on the rotation bearing. Rust and corrosion protection is at its utmost because all components are painted prior to assembly. Operators can quickly and positively verify bolt torque by visually inspecting the torque seal markings. Machined rotation bearing mounting surfaces. Inside surfaces of each boom are pre-painted prior at assembly. No mandatory rebuild periods required, aiding in reduced down times / lower overall maintenance costs.